Get to know the new Nexis Uni! One of our most popular databases, LexisNexis, has a new look and a new name – Nexis Uni! However, even though it works a differently and has a different name, it is still one of our most important databases for full-text newspapers and legal and business information. 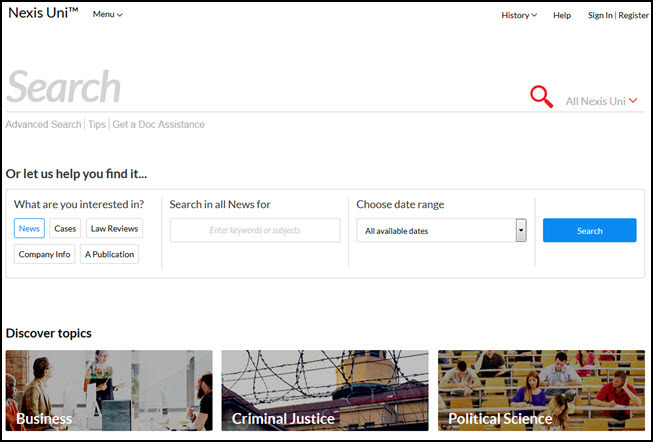 When you access Nexis Uni, you can search across all content from the big search box at the top of the page. Beneath it you will see options to do a more tailored search limited to news, cases, law reviews, company reviews, or a particular publication. Highlight the different options to see advanced search criteria specific to each. There is also a separate advanced search screen with even more granular options, including the ability to limit by date and content type. You can filter after you search by many categories, including location (where the source is published), publication type, subject, industry, geography (what area of the world is covered by the content) and more. Once you find what you are looking for and display the full item, you will see the options to print, email, download (to pdf), save to Google Drive, or search within the document text at the top of the page. Users can create a personal account in Nexis Uni to save search settings, searches and documents within the database. Once you are logged in, you can also annotate and save documents. This is a great option for frequent users! The new interface was released right before the beginning of fall semester, so we are still getting used to it! If you are interested in learning more about it, check out the Nexis Uni tutorials on YouTube, beginning with “How to Search from the Home Page.” You will also find tip sheets and can sign up for training sessions on the Nexis Uni Support & Training website. The Wm. T. Jerome Library will be open all night long so we hope you’ll consider spending your Sunday studying with the University Libraries and the Learning Commons. Need extra time to work on papers and exams? Have your own special spot in the library where you like to study? Need access to books and other library resources? The University Libraries extends its hours of operation (24-5 Sunday through Thursday) beginning Sunday, April 23 provide a safe and comfortable research and study environment free of disruption for our students, staff, and faculty. The University Libraries once again offer Individual Research Appointments (IRAs) to students. IRAs provide students with the opportunity to work one-on-one with a librarian on a specific research assignment. Students will develop search strategies, identify various print and electronic resources and discover services available in the University Libraries. To celebrate Black History month, Kanopy is highlighting a selection fo independent films, many exclusive to Kanopy, that showcase the stories of extraordinary African American musicians whose talent has shaped today’s music industry. Kanopy’s entire Black History Month collection is now available to watch here. This film explores the life, times and music of piano legend James Booker, who is described as, “the best black, gay, one-eyed junkie piano genius New Orleans has ever produced.” This roller coaster portrait brings to life the unforgettable story of this amazing musician. You See Me Laughin’ is a personal journey into the lives and music of the last of the Mississippi hill country bluesmen – farmers and laborers first, musicians second. Musicians who’ve labored for the blues tradition despite lives steeped in poverty and violence.The result is a raw, powerful music. America’s Blues explores the impact that the Blues has had on our society, our culture, and the entertainment industry. The Blues has influenced nearly every form of American Music and sadly, aside from its part in the birth of Rock and Roll, its influence often goes unrecognized. If music were a color, it would be Blue. This award-winning documentary tells the untold stories of female jazz and big band instrumentalists and their journeys from the late 30s to the present day. The many first-hand accounts of the challenges faced by these talented women provide a glimpse into decades of racism and sexism that have existed in America. In the 1970s Roberta Flack became a global sensation. Her style of soulful pop transcended to become the dinner party soundtrack for Middle America. It is a deeply personal story told alongside the wider context of America’s civil rights movement, a struggle that was to strike a chord all over the world. A tender, revealing documentary about one of the most famous and popular performing artists of the 20th century. Her legendary banana belt dance created theatre history; her song “J’ai deux amours” became a classic, and her hymn. Josephine Baker is portrayed as a true superstar, one with grace and humility. A musical art form, the American Spiritual, was born out of the folk songs of slaves. Melodies of backbreaking work were sung and passed on throughout the Deep South. Sorrow songs were used to console and transmit secret information. The spirituals have survived generations and continue to inspire all over the world. This documentary is an intimate look at Tupac Shakur’s life told through never-before-seen footage and interviews with his close friends, revealing an artist who grew up a thug, but one who soon tired of that lifestyle and its trappings, revealing a Tupac far different from the one most of America knows. By 15 years old, Frank Morgan was an accomplished saxophonist. As his notoriety grew, so did a steady heroin addiction, landing him in and out of jail for over 30 years. The Sound of Redemption offers a frank look into the ups and downs of Morgan’s life and a reflective look at African American culture in 1950s Los Angeles. This film excavates the hidden sexualities of Black female entertainers who reigned over the nascent blues recording industry of the 1920s. Unlike the male-dominated jazz scene, early blues provided a space for women to take the lead and model an autonomy that was remarkable for women. Canvas help, including assistance with Commons, is also available during drop-in Faculty Fridays from 1:00-5:00 each week in room 142 of Jerome Library. Questions about this new service may be directed to Colleen Boff, Associate Dean of UL (cboff@bgsu.edu / 372-7899).